He’s kid with a bright smile and an even bigger heart. His name is Maddox, and he’s patient at the UMPC Children’s Hospital of Pittsburgh, one of the 170 Children’s Miracle Network Hospitals in the United States and Canada. Much like the gamers who play games and heal kids for Northern Light Eastern Maine Medical Center through Extra Life, Maddox is gaming for his CMN Hospital. Why is this important? It’s sumple! Maddox is fighting cancer and he only has a few weeks to live. 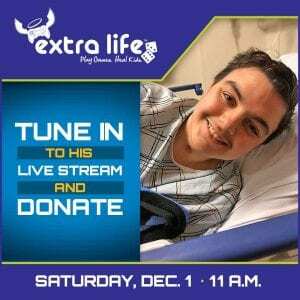 Join us in cheering Maddox on today as he hosts his Extra Life gaming marathon. You can watch his live stream on Twitch and share words of encouragement by visiting, Twitch.com. Maddox’s username is madghost0821. Go Maddox, and know that you and your family are in our thoughts and prayers.